Examine the case management structure, processes, and user interface components. Modify the process settings to explore alternative scenarios and extend the applications initial configuration. Use the rules in the sample as templates for creating and building your own application. The application user intakes requests from customers who need to have a product repaired. In a series of three screenflows, the user inputs the customer's information, the product (s), and a description of the problem. When the user submits the form, the system creates a Support Request case, and automatically creates Warranty Investigation and Repair subcases for each product. Ordinarily, a user begins the Warranty Investigation process first. The Repair case waits in a workbasket until the Investigation subcase resolves. In special situations, the user can choose not to wait and manually begin the Repair subcase. During the investigation process, the user indicates whether the product is under warranty. If yes, the Repair subcase advances to a Complete Repair assignment when the Investigation is resolved. If no, the subcase advances to a Notify Customer assignment. When both subcases are resolved, the parent Support Request case is resolved. Note: For the purpose of this article, one user handles all of the cases. On the tree in the left panel, select Support Request. On the right panel, click the Run arrow ( ) next to the Start Support Request starting process. The Perform user form opens. On the first screen, select a customer from the list and click Next. On the second screen, select a product and click Next. On the third screen, select a product and click Finish. The system creates a Support Request case (C-51) and opens its Review form. In addition, Two subcases, Warranty Investigation (C-52) and Repair for Black Widget (C-53), have been automatically created and are identified in the Case Contents section. Note the subcase statuses — Warranty Investigation is ready for the user to start (New), while Repair is assigned to a workbasket and waiting for Investigation to complete (Pending). Before beginning work on the Warranty Investigation subcase, click Waiting for Investigation Case to Complete to open its Perform user form. The message states that this subcase is waiting for the Investigation subcase to complete. The user can, however, can bypass this dependency and create the Repair subcase manually by clicking Start Repair . Click the Sample Support Request (C-51) link in the top left corner to return to the Support Request Review form. On the list beneath Warranty Investigation (C-52) case, click Complete Investigation of Issue. Its Perform form opens. Select the Yes radio button for Is this Product under Warranty? Enter a warranty expiration date, and a note. Click Submit to resolve the subcase. At the top of the Warranty Investigation Review form, click the Sample Support Request (C-51) link to return to the case's Review form. In the Case Contents area, note that the warranty Investigation subcase is resolved and the Complete Repair subcase is Open (updated from Pending-Investigation). In the Perform form, enter the Repair Notes information and click Submit to resolve the subcase. Support Request C-51 and its subcases (C-52 and C-53) are resolved. 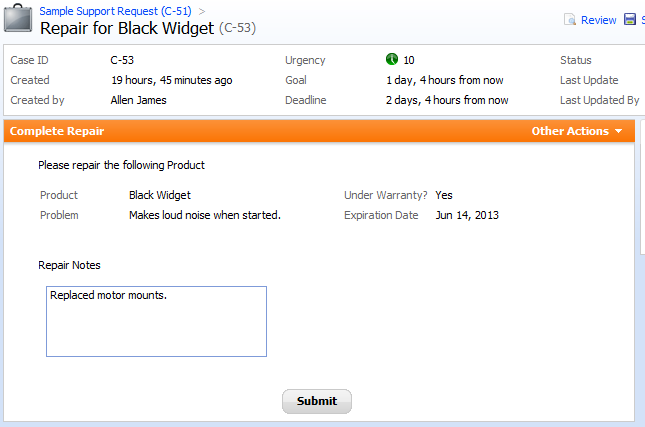 To see what happens when a product is not under warranty, create a new Support Request case. 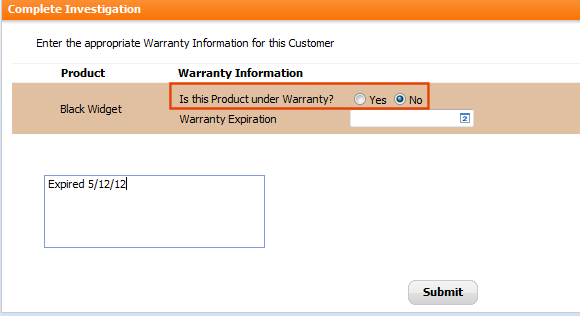 In the Warranty Investigation process, select No next to Is this Product under Warranty? in the Complete Investigation form. Click Submit to resolve the subcase, and return to the parent's Review harness. The Notify Customer assignment appears on the case list. Open the assignment and resolve it to resolve the parent case. 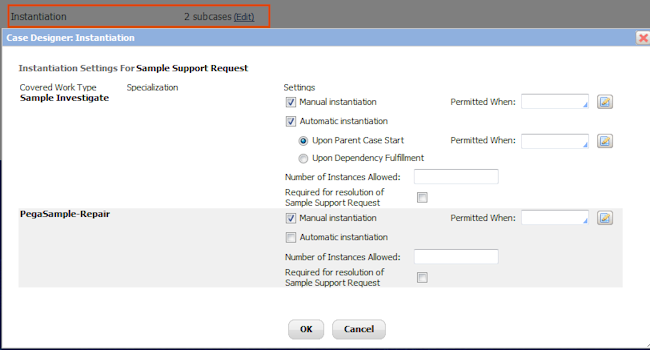 You use instantiation settings in parent case type rules and dependent assignment shapes in subcase processes to define how subcases are created (instantiated). Return to the Gallery to explore how this application creates subcases. A subcase is created when its parent case is created, either automatically by the system, or manually by the user. 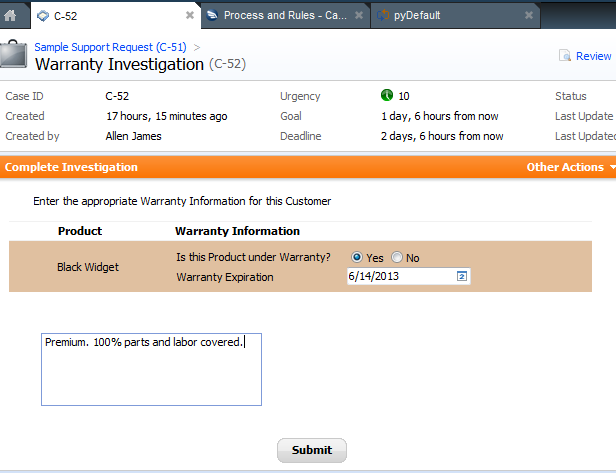 To see how the Warranty Investigation subcase is automatically created, select Support Request (Parent case) in the left panel. On the right panel, click the (Open) link next to the case type name to open the Case Type rule form. The Coverable Work Types area defines which case types are covered (subcase types), and how their subcases can be created. The system automatically creates (Automatic Instantiation) an Investigation subcase when the user creates a Support Request case. The user has the option of manually creating (Manual Instantiation) another subcase from the Other Actions list on the Perform user form. 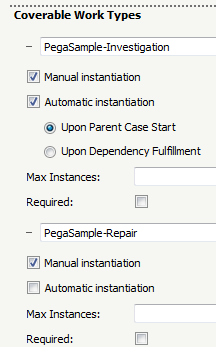 The user can also manually create a Repair subcase as defined in the PegaSample-Repairarray on the parent case type rule. A dependent subcase is created and waits in a workbasket when a subcase in another case type is created. When the "dependent on" subcase reaches a specified work status, the system automatically advances the dependent subcase's process. You use a Dependent-type Assignment shape in that process to configure the dependency conditions. On the left panel, select Repair. On the right panel, select the Starting Process Repair link to open its flow. 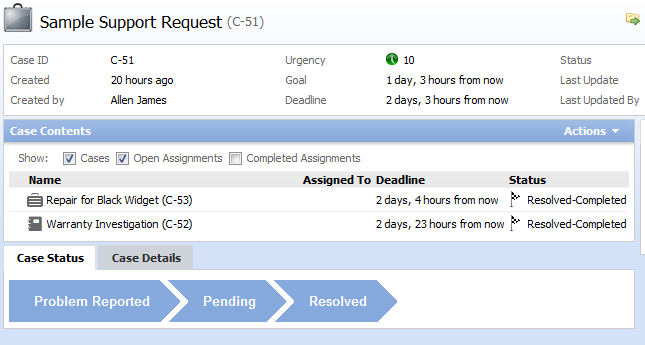 Double-click the Wait for Investigation to Complete Assignment shape to open its Properties panel. 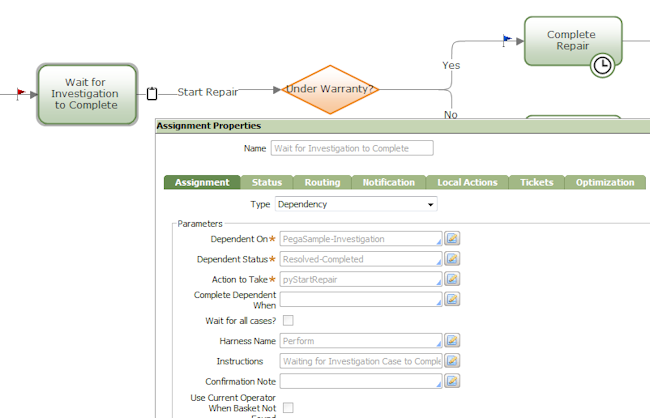 The settings in this Dependency-type assignment specify that a Repair subcase must wait for an Warranty Investigation subcase to reach a work status of Resolved-Completed before it can advance on the pyStartRepair connector flow action. You can alter some user form elements or process behaviors using settings in the Gallery's right panel, which corresponds to the Details tab on your application's Case Designer. On the left panel, select the case type you want to update. On the right panel, click the (Edit) link next to the setting. Make your changes in the pop-up dialog. Click OK to save your changes and close the dialog . Click the refresh icon ( ) on the tab bar to update the settings on the panel. Starting Process, Supporting Processes, Stages, Calculations, Data Propagation, Instantiation,and Validation creates a copy of the case type rule. Goals and Deadlines creates a copy of the pyCaseTypeDefault service level rule. Parties creates a copy of the pyCaseManagementDefault work parties rule. The following describes the Appearance, Stages, and Instantiation settings. Each subcase has a unique image that identifies it on the case list. You can customize the image by clicking the Appearance item on the panel. In the Appearance icon dialog, select an icon to replace the current one. In the Case Status tab at the bottom of the form, there is a work status-based horizontal array of read-only chevron images. They provide users with a high-level view of the individual tasks that must be performed in order to resolve the case. This setting appears only for parent case types, and reflects the values in the Coverable Work Types area on a Case Type rule form (described above in How subcases are created). As best practice, use this setting, not the case type rule, to make your updates. Explore the other settings on the panel. To modify a sample process, open the flow rule in the right panel by clicking the Starting Process link. Save the flow to a RuleSet in your application. Keep the Applies To and Flow Name key parts so that you can access and start the process from the Gallery. You can always return to the default flow by deleting your copy. To examine user interface components such as harnesses, sections, flow actions, and controls use the Rules Inspector tool. In the Designer Studio Quick Launch bar, select > Rules Inspector > HTML Rules. Click the icons to open the rules.